is still not yet completely determined. A road concept on behalf of the Latvian ministry of economics from the year 2007 proposed the route that is outlined in the following. It takes the cultural and touristic highlights into account and at the same time minimizes the troublesome gravel roads. Unfortunately, it was not always possible to avoid longer road sections with much traffic. The first part of the route leads over 144 kilometers from the Lithuanian-Latvian border through Liepāja and Pāvilosta to the vacation resort Jūrkalne. 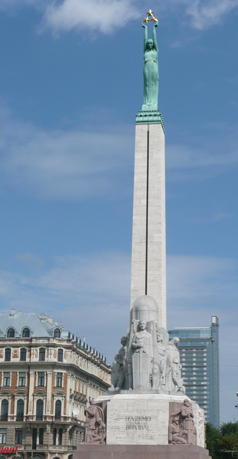 From here, there are 200 kilometers to the capital Rīga/Riga. Along this way you find Alsunga, Kuldīga, Kandava, Tukums and the glamorous coastal resort Jūrmala. The following part of the way with its 134 kilometers through Cēsis and Smiltene to the Latvian-Estonia border town Valka/Valga starts in Sigulda which is situated closely to Riga. The most comfortable way from Rīga/Riga to Sigulda is by train. 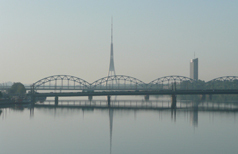 The capital Rīga/Riga and maybe also the closely situated coastal resort Jūrmala are famous tourist attractions, hence many cyclists decide to make a stop there. However, it comes as a surprise that the places and regions along the way are very touristic as well. Liepāja, Kuldīga, Tukums, Sigulda and also Smiltene as well as the passage through the Gauja national park are some examples for that. The local development of cycle tracks in Latvia has started long ago. First touristic tours are finished and signposted. Tourist information offices provide superb maps and tips for accommodation. You are welcome to ask for recommendations for a nice restaurant for an evening or where to find the next bicycle repair shop there. Signposting for bicycles is only available along the way between Jūrmala and Rīga/Riga, and as "Route 6 - Tour de LatEst" between Sigulda, Cēsis, Smiltene and Valka. Except for the about 50 kilometers of gravel road, the quality of the rest of the road is considered to be good to satisfactory. It is possible to arrive in or depart from Latvia with a bike either by taking a ferry to/from Liepāja or by an airplane to/from Rīga/Riga. Here you can find places to stay. These were recommended to us by cyclists or we have used this yourself.